The plain wooden toothpick, it may be argued, is among the simplest of manufactured things. Sucking at the stuck food debris can sometimes be effective for not always for stubborn little things. Even squirting saliva between the teeth to flush out food debris, using finger nails or the tongue too can be ineffective many a times. The most common alternative to natural and self-contained means, is the familiar and modern toothpick. In 16th century, disposable toothpicks were mass produced by the nuns so people could use them to pick up sticky confectioneries and presumably also use them to clean any residue left in the teeth after the sweets were consumed. With the commercialized ubiquity of disposable wooden toothpicks, the concept of the toothpick as status symbol, which stubbornly persisted well into 19th century, thanks to Charles Foster, American inventor of modern toothpicks, would slowly begin to fade and give way to silver and gold toothpicks, once immensely popular amongst society’s most well-heeled elites. But, it soon returned to become an household item that can be easily found in stores across the world today. Good oral hygiene results in a mouth that looks and smells healthy. This means: Your teeth are clean and free of debris. Gums are pink and do not hurt or bleed when you brush or floss. But, one cannot carry a brush or floss while dining out. Hence the toothpick comes in handy. It should be used in a way so that the gums or teeth are not harmed. Picture this: You are at a restaurant. You just finished eating your meal and the waiter brings toothpicks, white saunf (fennel seeds) which acts as a mouth freshener, and the bill too. But, the last thing you may want to do is to bite and chew again and then using a toothpick to remove the food debris. 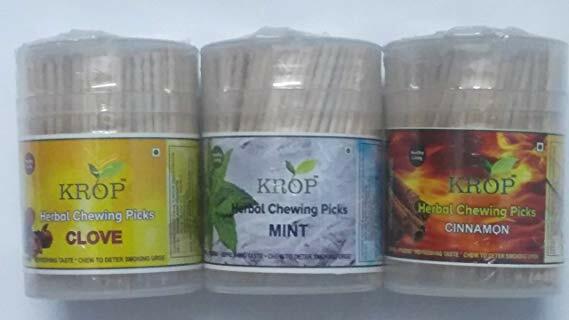 To save you from that ordeal, KROP toothpicks in India, introduced herbal toothpicks with flavoured essential oils. They are a great way to dental hygiene and moreover uplifts your mood and creates a good breath. So, it is probably time to bid adieu to mouthwashes and mouth fresheners. Peppermint has shown health benefits for irritable bowel syndrome (IBS), nausea, skin conditions, headaches, cold, and flu.